THANKS TO THE OUTSTANDING IN THE FIELD TEAM FOR AN EXCELLENT WEEKEND OF EXTRAORDINARY EVENTS. We’ve captured some great images from both Outstanding dinners on our Facebook page. BLOG POST WITH PHOTOS COMING SOON…! The bus is coming back. And twice this time around! 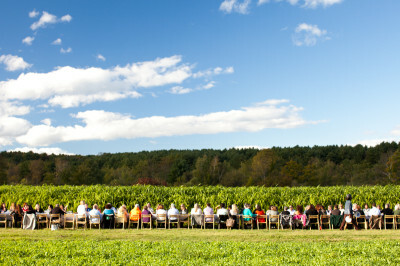 On the weekend following Labor Day when the weather is pretty much perfect around here, the Outstanding in the Field bus will be arriving in the Berkshires for two events featuring delicious off-the-farm dinners designed and prepared by notable chefs at a set of stunning Berkshire locations. 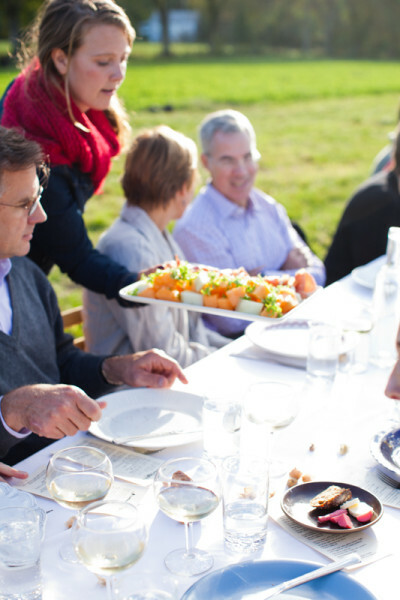 Outstanding in the Field (OITF) is a roving culinary adventure – literally a restaurant without walls. 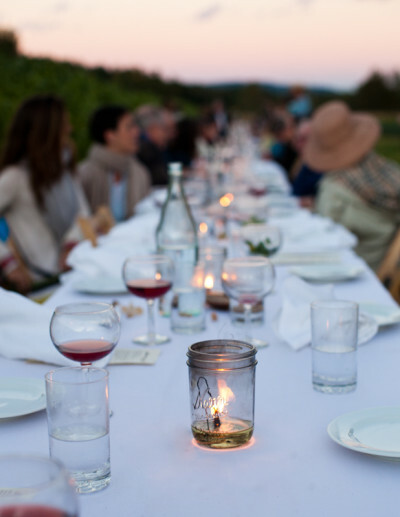 Since 1999, OITF has traveled around the country setting their long table in fields, gardens and vineyards, and on beaches and mountaintops. Wherever the location, the consistent theme of each dinner is to honor the people whose good work brings nourishment to the table. Their mission is to promote local food and agriculture, reconnect diners to the land and the origins of their food and to honor the local farmers and food artisans who cultivate it. The organization donates to a number of farm- and food-related groups whose missions align with those of OITF. Ingredients for each meal are almost all local, sometimes sourced within inches of the guests’ seats at the table, and generally prepared by a celebrated chef of the region. 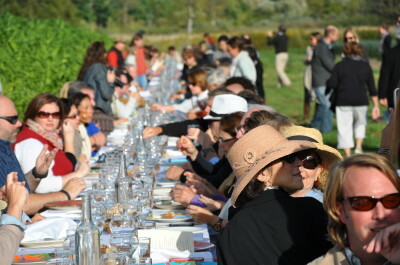 After a tour of the site, guests settle in: farmers, producers, culinary artisans and diners sharing the long table. OITF’s first visit to the Berkshires took place in 2012 at Indian Line Farm in South Egremont, the birthplace of the first CSA (Community Supported Agriculture) farm in North America. The event sold out in four hours the day tickets went on sale. 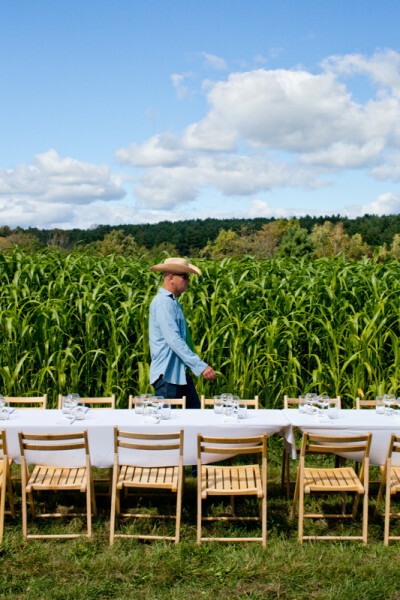 To kick off the weekend, the OITF team will set up their epic celebrated table on the hills of Lila’s Farm in Great Barrington on Saturday, September 7. Dan Smith, chef-owner of John Andrews: A Farmhouse Restaurant in Egremont, will prepare a four-course meal in the great outdoors on a wood-fired grill using farm-fresh ingredients. This event is sold out but tickets are still available for the September 8th event. 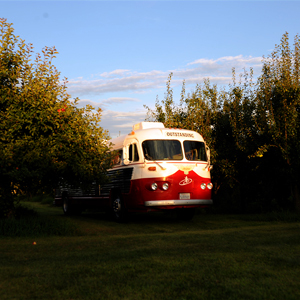 On Sunday, September 8, the OITF bus will travel north to Hancock Shaker Village (HSV) in Pittsfield where Chef Brian Alberg from The Red Lion Inn in Stockbridge will man the field kitchen with his crew and present a four-course meal to 150 guests. 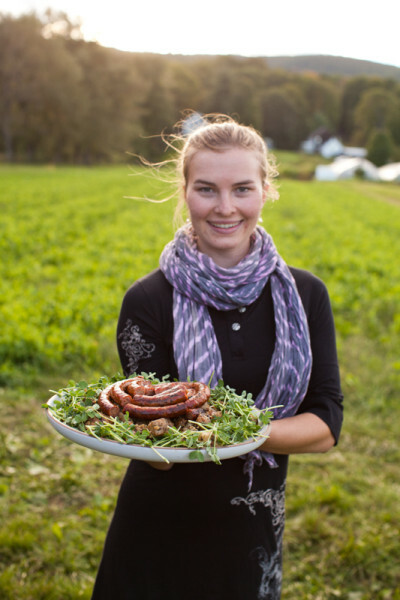 Chef Daire Rooney of Allium in Great Barrington helped prepare the OITF dinner at Indian Line Farm in 2012 and she will once again be collaborating with Chef Brian and this year, Chef Dan. She has worked in partnership with Brian and Dan for many years and will be a guest chef at both dinners this year. Copyright Lincoln Russell. All rights reserved. 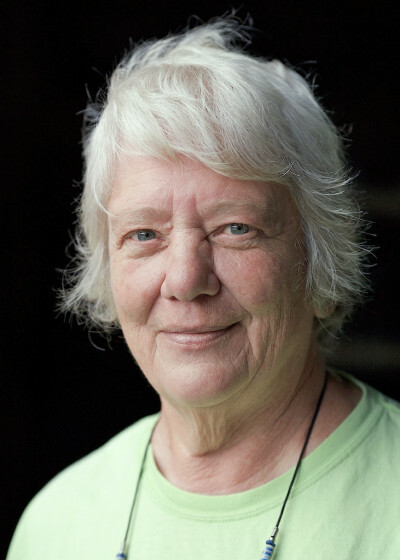 Lila Berle is a lifelong ecologist and farmer. She is dedicated to land conservation in the region, particularly the preservation of historic homes and view sheds at cultural institutions. She has established conservation easements on 850 acres in Monument Valley and on Monument Mountain in the Southern Berkshires. She has been chairwoman and/or president of the Norman Rockwell Museum, Chesterwood, Edith Wharton Restoration and the Berkshire Hills Regional School Committee. She currently serves on the boards of The Mount, Berkshire South Community Center and Sculpture Now. She was the first female Senior Warden at St. Paul’s Episcopal Church and has been an active member there for more than 50 years. Farming and her family are her passions. Pulling lambs, and mowing and baling hay, are favorite ways to spend a day. Lila has four children, 14 grandchildren and 800 sheep on the ground today. Lila’s Farm is located at 8 Locust Road in Great Barrington. 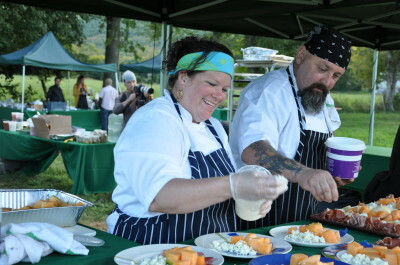 The OITF team had such a notable experience working with Chef Brian Alberg last year, they wanted a repeat performance. Chef Brian, hailing from The Red Lion Inn and cooking in the historic landscape of Hancock Shaker Village, the living history museum that brings the Shaker story to life and preserves it for future generations, is an extraordinary pairing and one not to be missed. 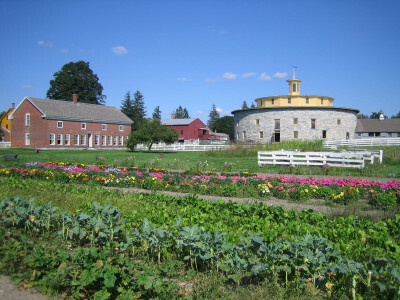 An outdoor history museum and educational resource situated on a picturesque expanse of farm, field and woodland in Pittsfield, Mass., Hancock Shaker Village affords visitors authentic experiences in 20 historic buildings, heirloom gardens, and with 22,000 examples of Shaker furniture, crafts, tools and more. This National Historic Landmark depicts daily life at the Shakers’ City of Peace through its 220 years. Partake of guided tours, craft and cooking demonstrations, workshops, hikes, and a Discovery Room with hand-on activities for children. Amenities include the Village Harvest Café and the Village Store. An audio tour is available in English, French, Italian and German. Additionally, HSV offers a CSA program, with shareholders enjoying weekly distributions of heirloom vegetables, fresh herbs and cut flowers from early June through late October each season. Both dinners will begin at 3 p.m. with passed hors d’oeuvres at the initial greeting area followed by opening remarks and a farm tour around 4 p.m. Seating for the four-course, family-style dinner (including dessert) will begin at 4:45 p.m. The price for the dinner is $220 per person. The Saturday night dinner is sold out but tickets for the Sunday, September 8 event are still available. For more information about the event, visit the OITF site. The Red Lion Inn will be offering ticket buyers an Outstanding rate for the weekend. Guests of the dinner can stay Saturday, September 7th through Monday, Sept 9th in their new Maple Glen guesthouse with a room rate of $95 per night. Call 413.298.5545 and mention Outstanding in the Field to make a reservation. 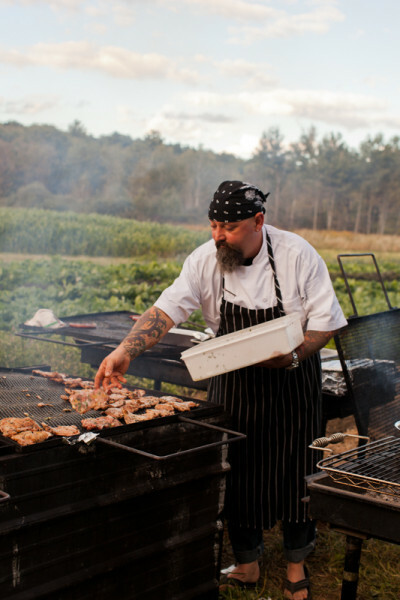 Chef Dan Smith | John Andrews Farmhouse Restaurant, South Egremont, Mass. 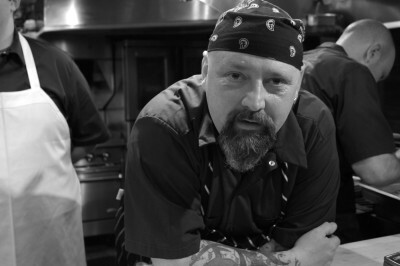 Chef Brian J. Alberg | The Red Lion Inn, Stockbridge, Mass. Berkshire Farm & Table will provide behind-the-scenes coverage, offering a backstage pass to these celebrated events. Social media coverage will include Facebook and Twitter updates. Follow hashtag #OITFBerkshires for posts. 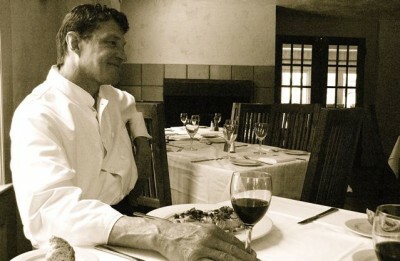 Dan Smith has been the chef-owner of John Andrews Restaurant in South Egremont, Mass., since 1990. He was brought up on a family farm in Iowa where his family has been farming for generations. His experience with fresh food grown on the farm is where his connection to cooking began. Smith studied agriculture at Iowa State University, planning on continuing the family tradition. While in college, he began to work in restaurants and realized that his passion was not for growing food, but cooking it. After college, Smith moved to Naples, Fla., and worked at Villa Pescatore, The Ritz-Carlton and Michael’s Bar and Grill. In 1988, he moved north to work at the Ragamont Inn in Salisbury, Conn., and fell in love with the Berkshires. He then worked at what was then Sebastian’s Restaurant in South Egremont, and in 1990 purchased the restaurant and renamed it John Andrews. John Andrews Restaurant is located in an 18th century farmhouse two miles east of the village of South Egremont. Chef-owner Dan Smith has worked with family farms since the restaurant opened in 1990 and much of the food that is served at John Andrews is grown or raised locally. In 1992, Smith planted the John Andrews garden, which now provides vegetables and herbs on the property. The commitment to local products and service is evident in the dining experience at John Andrews. Called “skillful modern cuisine” by Food & Wine Magazine, the restaurant combines new American and a touch of northern Italian cuisine with a focus on local ingredients. John Andrews Restaurant is located at 224 Hillsdale Road in South Egremont, Mass. The GPS address is 1 Blunt Road in Great Barrington, Mass. 01230. The restaurant is open Thursdays through Tuesdays at 5 p.m.
(Closed Wednesdays.) For reservations and information, call 413.528.3469, email <jarestaurant@gmail.com> or visit www.jarestaurant.com. Brian Alberg, Executive Chef and Director of Food & Beverage at The Red Lion Inn, is a staunch supporter of the local food movement in the Berkshires and Hudson Valley. He is President of Berkshire Grown, an organization dedicated to promoting the support of local farming and strengthening the relationships between local farmers and restaurants. He began his tenure at The Red Lion Inn in July of 2004 and during his tenure, has established strong relationships with regional farmers and food producers and purchased more than $500K in local foods annually, a compelling contribution to the Berkshire-Hudson economy. Alberg is a member of the James Beard Foundation and serves on the board of the Railroad Street Youth Project, which provides young people with the opportunity to explore the culinary arts alongside a professional chef. He is an active member of the Chef’s Collaborative, contributed to their cookbook, which was published earlier this year and participates annually in Earth Dinners. Alberg took home top prize in Boston’s American Lamb Jam in 2012. A native of Copake, NY, Alberg began his culinary career as an apprentice at the former l’Hostelierre Bressane. After graduating from the Culinary Institute of America in Hyde Park, NY, in 1987, he oversaw the kitchens in a number of high-profile Berkshire restaurants. He left the area in 1993 to become Executive Chef at Dudley’s Restaurant in Westchester, NY, where he earned a “Very Good” rating from the New York Times and made his first appearance at the James Beard House. Alberg went on to work as executive chef and later Director of Food & Beverage at the Old Saybrook Inn & Spa, a AAA Four-Diamond property, where he was honored for the first time at the James Beard Foundation. Alberg then moved into the corporate world with Marriott where he helped open a number of hotels as well as create a Mediterranean menu with recipes and training information that was distributed to Marriott and Renaissance Hotels across the globe. Alberg resides in Kinderhook, NY. A charter member of Historic Hotels of America and winner of the Wine Spectator award for excellence, The Red Lion Inn (c. 1773) has been providing food and lodging to guests for over two centuries. It offers 108 antique-filled rooms and suites, formal and casual dining, a gift shop, pub with nightly entertainment and a full range of amenities including free WiFi, a year-round heated outdoor pool and in-room massage therapy. The Inn is recommended by National Geographic Traveler, The New York Times and The Boston Globe and has won awards and been noted for its commitment to sustainability. For more information, contact 413.298.5545, or visit www.redlioninn.com. To receive information about the event, join the OITF mailing list. Photos of last year’s events plus photos from Outstanding in the Field’s website are available by contacting Angela Cardinali, Berkshire Farm & Table, at angela@angelacardinali.com.